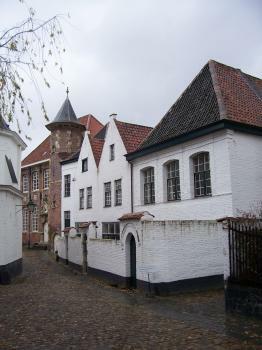 The Flemish Béguinages are secluded compounds made by a religious movement. The Beguines were women who entered into a life dedicated to God without retiring from the world. In the 13th century they founded the béguinages, enclosed communities designed to meet their spiritual and material needs. 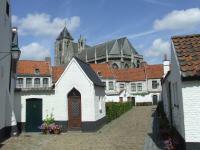 The béguinages hold houses, churches, public buildings and gardens make up a secluded town. 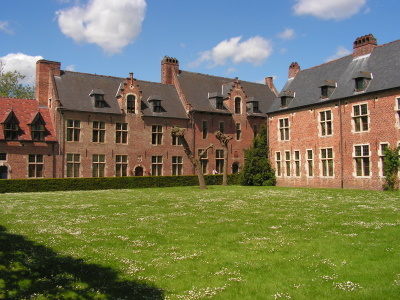 In Belgium, the 13 world heritage béguinages consist of the ones in Gent, Leuven, Kortrijk, Mechelen, Brugge, Dendermonde, Turnhout, Sint-Amandsberg, Sint-Truiden, Lier, Diest, Tongeren and Hoogstraten. 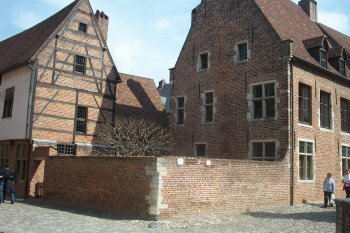 The béguinage I first visited (the one in Lier) was not in a very good state. Some parts of it seemed really rundown, although people did live in them. The 'Groot Begijnhof' (there's also a smaller one) in Leuven however is a true haven of peace and quiet. Behind a modest gate a well preserved neighbourhood lies ahead. On the Sunday that I visited the site, many visitors - a lot of them foreign tourists - roamed the streets of this picturesque beguinage. There's a photo opportunity around every corner. Great place! 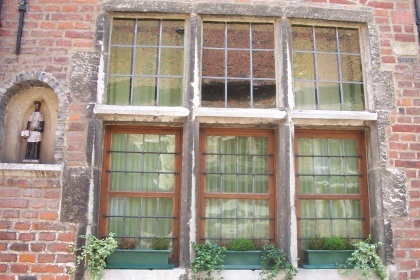 In 2013 I visited the Petit Beguinage of Gent. It is one out of the city's 3 that is incorporated within the WHS (the other is at St. Amandsberg). 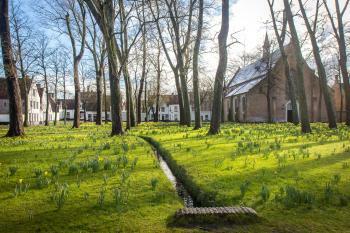 The beguinage lies a bit south of the center, conveniently close to Parking P3 South. It has several streets within enclosed walls, and access to the individual houses from these streets are blocked by a wall also. The small houses are now in private use, and even some cars have made it into the quiet zone. Part of this beguinage is still being restored, although most of the houses are already blinking in red and white paint. There were a few other tourists around, and although it is a nice place for a stroll there's not a lot that reminds of its former use. My wife and I visited the Beguinages of Leuwen and Bruges in August 2017. We chose these two as they seemed to be most representative of what Beguinages were really like. Of the two, I preferred the one in Leuwen as it really felt like a community still lived there. The one in Bruges was much more touristy and had a lot of folks wandering around. I visited 3 of the béguinages in January 2017. The béguinages can be thought of as secular convents for women who were unmarried but didn't want to have to live with their families. They started during the crusades when there was a surplus of unmarried women due to so many men being sent off to war. Béguinages ceased their original purpose in the early 20th century. Today they are just homes and properties where people live. Visiting them is very low key as the home are still in use. There are no formal visitor centers, and only a small amount of signage. 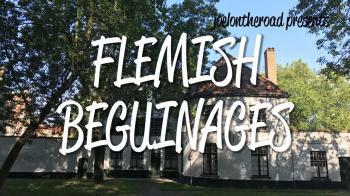 View my website to read more about the Flemish Beguinages. Honestly, I thought this (multi property) site would be a bit boring but I actually really enjoyed visiting a few of the places included in the listing. Not only do the beguinages have a really interesting history - they are actually quite photogenic! The largest was the beguinage in Leuven and you can easily spend a while there walking through the little streets. In Ghent there are two - the older one in the city centre is much more picturesque. My favourite was the beguinage in Bruges. It's wonderful with the trees and the flowers in the central garden, as you can see in my photo. In the course of a long weekend in Flanders, I visited 6 béguinages in 5 cities - the one in Lier (quite nice, but nothing special), Ter Hoyen in Gent (large green space, rather idyllic, also known as the Small Béguinage), Sint Amandsberg in Gent (also known as Grand Béguinage, large area with a huge church), Ten Wijngaerde in Bruges (very pretty location next to a canal with many swans, today a Benedictine convent), the Grand Béguinage in Leuven (the nicest one of them, brick architecture on a large area, really a city within a city, today used for students of the local university), and the one in Mechelen (nothing special, the least impressive of them all). It is fun to walk through the pretty Flemish towns on the search for yet another béguinage, and once found, there is (almost) always a nice green space in the middle to relax for a while. They deserve their place on the WH list for their historic and architectural value, and for the insight into the unique life of the béguines, these "not-quite" nuns who temporarily chose to live in these secluded areas. 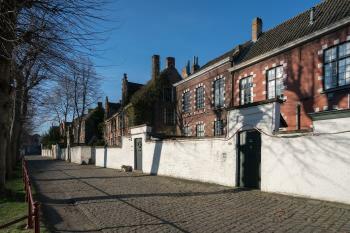 There is also a very nice, and very similar, béguinage in the centre of Amsterdam - a possible extension? Your page does not mention the Begijnhof in Antwerpen. We saw that and the one in Brugge. We felt the one in Antwerpen was actually more interesting architecturally and in how it was planned. The central garden was certainly much more attractive and varied in planting than the open, grassed, tree filled area in the Brugge Begijnhof, and the fact that it was not overrun by tourists made it extremely peaceful. The Brugge Begijnhof has huge parties of tourists being dragged around it, by and on the hour, by tour guides who talk incessantly; there is no peace there. It's quite ironic. 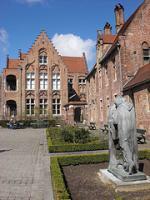 During my summer vacation in Brussels I visited several Beguinages. The most beautiful for me was the one Leuven. It is large, full of red brick buildings, has several bridges over canals and lots of green. Together with the lovely town hall this was the peak of this truly charming city! Bruges is also impressive. I loved the location close to the canals and the Minnewater as well as the large court with trees. The white paint of the houses and the unimpressive church spoiled the impression for me a little. In Gent I visited all three Beguinages and was a bit confused: While it is clear that the Klein Begijnhof and St.Amandsberg have Unesco status there is some confusion about the Oude Begijnhof. In the (otherwise excellent) tourist information in the vismarkt I was told that all three are Unesco sites and there are official signs to it with the Unesco sign! Anyway, I walked there since it is close to the center. It is a nice place though there are no outer walls anymore and it is not well signed. I couldn't finde a map that would show which of the surrounding blocks were part of the beguinages. To the south east from the center is the Klein Begijnhof, with is very nice though at the time they are doing some renovation work, but that is eventually a good thing. It isn't really that small and has several streets from different periods and an impressive church (I could only see the outside). The most impressive of the three was certainly St.Amandsberg (15 minutes by bus 6 from "Zuid", close to the Klein Begijnhof). About as big as Leuven, with a big gothic church and build entirely of a dark red brick. It has three squares and about eight streets. It is very unified in style since it was build on the site of an old beguinage in 1874. Obviously there were still many beguinages at that time! 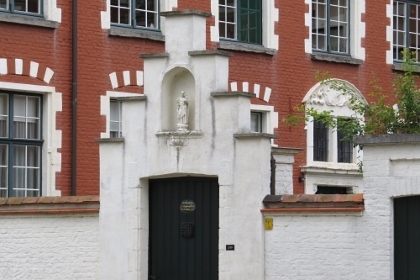 If you are in Brussels visit also the tiny Beguinage in Anderlechen (a part of Brussels). It has a nice little museum with an excellent film about the Beguines. Included in the ticket for 1.25 Euros (!!!) is the visit to the Erasmus house with a charming garden. I agree with others who say that you can easily tick 2 WHS off your list when visiting belfries & beguinages. I have visited 6 out of the 13 inscribed sites and I think that Ghent and Leuven will give you a very good overview of what the beguinages' purpose was. Moreover, they are well kept and looked after. I have visited the following begijnhoven: Bruges - so pretty and calm with a lovely tree-filled green in the centre; Lier - lovely and one of the best with a real sense of the enclosed community of days gone past; Gent - there are three of them varying in attractiveness; Anderlecht (Brussels) - tiny and utterly charming; Leuven - rather formal and modernised as part of the KUL (University), but tell-tale signs of how it must once have looked naturally; Oudenaarde - small and not hugely memorable; Kortrijk - lovely with beautiful green and pretty chapel; Antwerp - pretty; Mechelen - not quite such an enclosed feel but still pretty. I love these places !! Having travelled pretty extensively in Flanders, I have managed to see quite a few Begijnhofs. The most impressive one I have seen so far is the Groot Begijnhof of Leuven. It is quite large and the quiet winding cobbled streets and redbrick houses are a lovely place to wander, especially if you are recovering from a long night in this superb cities student bars. Whilst visiting friends in Gent I wandered around for a morning visiting the Begijnhofs there. Both of the inscribed areas were quiet refuges and displayed all the hallmarks associated with this style of urban planning. Sint-Amandsberg was a longish walk from the centre however it was very large and was the last example to be built. Walking around it was nice to see that it was still fully inhabited; there were lots of children being dropped off by their parents at one house which was decorated by balloons. One of the most charming examples was in Kortrijk. This walled community is tucked just behind the main market square but it feels incredibly serene. In here there is a small museum dedicated to the lives of the beguines, and also one of the houses is now a guest house, offering perhaps the only opportunity for a short term stay for the casual tourist. Even the Begijnhof in Brugge is calm in comparison to the rest of the tourist bustle of the city. This is where the real charm of the Begijnhofs lies; they are exceptionally well preserved examples of Western European urban planning. Whilst there are many other instances of this in other cities in the area, a lot of them are overexploited. However in these little pockets of Flemish towns and cities everyday life still continues, without a lace shop or waffle stand to spoil the ambience. The description of the beguinage of Lier on your site is outrageous. No part of it is "really rundown". Your own picture shows houses that have been completely renovated. Of course people still live there, there is a long waiting list and people fight for every house that becomes available. The church has been restored to its previous splendor as well. Please urgently update your site !!! Since I live in Belgium and was born near Courtrai (French name of the city), I pass the Kortrijk (Dutch name) beguinage nearly daily. It's not the most spectacular in Belgium but I like the quiet atmosphere. Role of Women: "The béguinages bear exceptional witness to the cultural tradition of independent religious women in north-western Europe in the Middle Ages."